Despite its growth and the amount of attention it receives, the micro-blogging service Twitter appears at this point to play a relatively small role in sharing of links to news sources. Of the top 21 sites for which there were data, Twitter showed up as referring links to just nine. And for all but one of those nine, Twitter sent only about 1% of total traffic. million in 2010 and up to 500 million in 2011. 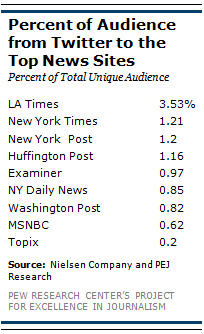 Of the top news sites, one stood out for getting more traffic via Twitter than anyone else. At LAtimes.com site, 3.53% of its traffic came from Twitter; that is more than it received from Facebook (2.05%) and more than triple the next site on the list of Twitter beneficiaries. Only a handful of other sites made the list for referring substantial amounts of traffic. And these all tended to be aggregators, search engines or social networks where consumers shared or recommended content. Yahoo (Yahoo News and Yahoo Search combined), for instance, appears on 7 o f the top 21 sites. Reddit and StumbleUpon, two aggregators of news, both show up as a referrer on 8 of the top 21 sites (ABC News.com, Boston.com, CNN.com, Examiner.com, HuffingtonPost.com, DailyMail.co.uk, NYTimes.com, USAToday.com). Finally, Ask.com (formerly askjeeves.com) one of the Web’s oldest search engines, shows up as a referral page on 4 of the top sites (Examiner.com, Huffingtonost.com, Topix.com, ABCNews.com).